Hairy blazing star (Liatris hirsuta*) of the Aster (Asteraceae) family has vibrant violet to lavender flowers, typical of many species in the genus. In the U.S., hairy blazing star is reported from Texas and northward to Nebraska and Iowa, with scattered reports in Mississippi, Alabama, and Georgia. In Arkansas, it is found throughout much of the state except for lowlands of the Mississippi Alluvial Plain and West Gulf Coastal Plain. The origin of the genus name has been lost. The specific epithet is Latin for “hairy”. Habitats consist of sunny rocky outcrops, glades and prairies with fairly well-drained soils. Other common names include hairy gayfeather (based on flower appearance) and Rydberg’s blazing star (described by Per Axel Rydberg in 1931). Hairy blazing stars have globose corms with tops covered with short peaks that served as the bases for previous stem growth and a rounded to knobby bottom from which long skinny white roots grow. New growth buds, appearing across the corm’s top in mid-winter, produce only tufts of basal leaves or stems that have same-appearing “basal” leaves. Stems, unbranched and terete with a length of 2 to 4 feet, are light green with slightly raised darker green ribs that extend down from leaf bases. The slender stems, to about ¼ inch in diameter, have a slight taper from base to apex. Stems, not having “extra” girth at point-of-attachment to the corm, typically become reclined unless supported by other stems or other vegetation. Stems and leaves are roughened by straight, spreading hairs. Photo 1: This corm, with eight stems, is 3 inches in diameter and 2 inches thick. Fibrous roots grow from knobs at the base. Photo early August. All leaves are linear to linear-lanceolate with the largest (to 8 inches long and 1/8 to 1/3 inch wide) being basal-cauline leaves. Size of cauline leaves gradually decreases up stem, with uppermost leaves being ¾ inch or less long. Pliable spring leaves become stiff, rough and twisted as the growing season progresses. Leaf color is medium to dark green above and below, with the upper and lower midvein being the same light green as the stem. Upper leaf blade to either side of the midrib tends to be up-turned (involute), especially at the entire (smooth), somewhat crinkly margins. Venation, largely obscure, is parallel to leaf margins with the upper midvein slightly expressed while the lower midvein is slightly depressed. Pubescence occurs on upper and lower surfaces of leaves and along leaf margins (ciliate pubescence). Photo 2: In this sunny, rocky habitat, new stems become apparent above their basal leaves. Previous year’s dead stems are splayed around the new growth. Photo early May. Cauline leaves, positioned all around the stem, are sessile while lowermost leaves are also clasping. Leaf separation decreases from ½ inch (lower of stem) to ¼ inch (higher on stem). Cauline leaves are slightly narrowed near their bases and have a gentle taper to their acute apexes. Inflorescence of hairy blazing star, in mid to late summer, consists of composite flower heads. Along with a solitary flower head at stem apex, additional lateral heads grow from upper leaf axils. Generally, wherever the lowermost lateral flower head occurs, almost all higher-up leaf axils also produce flower heads. Depending on age of plant and its habitat, a vigorous stem may have 40+ heads attached to its upper 18 inches. Flower heads mature and reach anthesis from stem apex, downward. Lower flower heads of a vigorous plant may be on short branches with a leaf or two (or even a lateral flower head or two), while higher heads may be on short pedicels attached to the stem or may be attached directly to the stem. Flower heads of hairy blazing star have disk florets only (discoid head); ray florets are absent. Heads have tightly bound, spindle-shaped involucres that are to about ¾ inch long and ⅜ inch wide. Involucral bracts (phyllaries), in six to eight overlapping (imbricated) series and of unequal size, are oval to oblong, spreading, and with acutely-tipped, recurved apexes. Inner phyllaries are smaller, with shorter recurved tips. Lower portions of phyllaries are firmly pressed together, but can be separated with little effort. Phyllaries, mostly glabrous, have ciliate margins. Involucres, which feel hard and bristly, may be purplish in sunnier sites. Photo 3: The flower heads do not have ray flowers. In this photo, the terminal flower head has passed anthesis. Pubescence of stem, leaves and involucres can be seen. Photo late July. Disk florets, 10 to 20+ per head and ⅖ to ⅗ inch long, have corollas that are a vibrant violet to lavender color. At anthesis, the corollas each have five short lobes that flare outward from long tubular bases. Pistils have a bifurcated style that exceeds the length of the tube. The “arms” of the style, joined inside the tube, twist-about in random, rather wispy fashion. Stigmas are not noticeable. Stamens, hidden within the floral tube and attached to the tube’s base, have long slender filaments with equally long and slender brown to purple anthers that split lengthwise to release white pollen. Corollas, set atop elongate inferior ovaries, are surrounded by a ring of long hairs (pappus) that are half the length of the tubes. Photo 4: Buds of the tubular florets have round-pointed apexes that flare open to expose five lobes. Styles are strongly exserted while stamens are hidden within the tube. Photo late July. Photo 5: Display of florets from bud to anthesis (right to left). Corollas and pappus attach to top of elongate ovaries. Inset shows ovary with pappus (left), style (right, removed from ovary), and anthers within cut-away corolla tube (center). After the growing season, plants dry and involucres disintegrate. One-seeded, indehiscent, elongate fruits (cypselae), ¼ inch long, with fluffed-up pappus are dispersed by wind. The ribbed cypselae have flat tops with flared long hairs (pappus) and tapered bases. Fertilized and unfertilized cypselae have the same appearance, but fertilized cypselae are more firm. Photo 6: With involucre disintegrating, cypselae are set for wind dispersal. Photo mid-December. For a garden or natural area, blazing stars should be welcome due to their long-lived nature, adaptability to rocky soils, their texture and strong flower color. Blazing stars are also good nectar plants for butterflies. 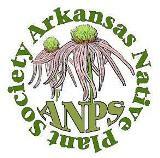 Among the at least ten species and additional varieties native to Arkansas, are several that have a more upright structure and may fit better in a limited space. Of the other Arkansas species, the one most similar to hairy blazing star is scaly blazing star (Liatris squarrosa). The main characteristic that helps identify hairy blazing star is that the involucral bracts are spreading to recurved (instead of ascending to spreading) and outer bracts are shorter than inner bracts. Some authorities classify this species as Liatris squarrosa var. hirsuta. This entry was posted in Know Your Natives, Native Plants, Wildflowers and tagged Asteraceae, Know Your Natives, Liatris, Liatris hirsuta. Bookmark the permalink.